We absolutely love family days out and we look forward to our family adventures, exploring our local area and visiting places far away. As long as we are together, we always have an amazing time. In a few weeks, we will become a family of four and, although we are all excited, we are aware that the family dynamics might change once the new baby arrives. As February half-term was our last school holiday before the baby comes, we made the most of it by going on different adventures. 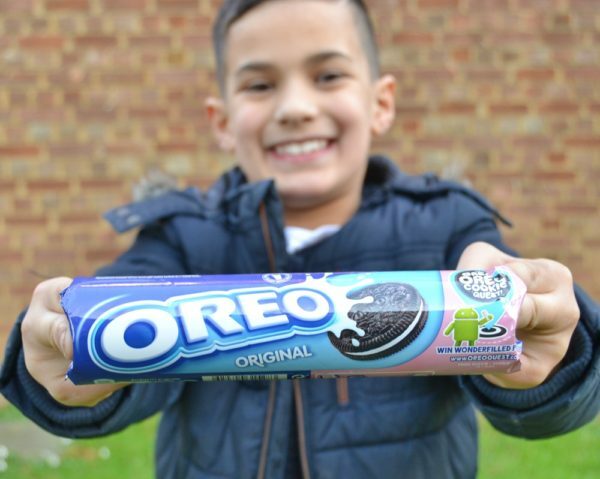 During our family day out, we created our own unique Oreo cookie quest to celebrate the launch of The Great Oreo Cookie Quest, an on-pack competition and interactive cookie quest activity that you can take part when you buy promotional packs in store. You can win wonderfilled prizes, including a family trip to California, by following the instructions on pack. Throughout our blog post, keep an eye out for hidden Oreo cookies in the pictures. 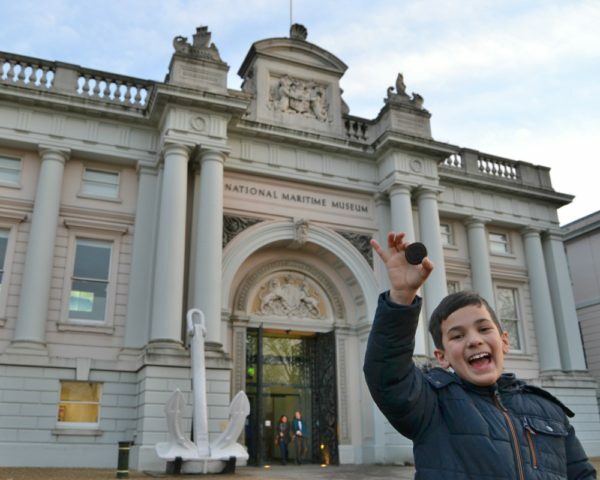 A couple of years ago, little man went to the National Maritime Museum in Greenwich with his school and he absolutely loved it. He wanted to explore it one more time and show us around. I must say, it is one of the best museums I have ever been to. It is very interactive, fun and hands on. 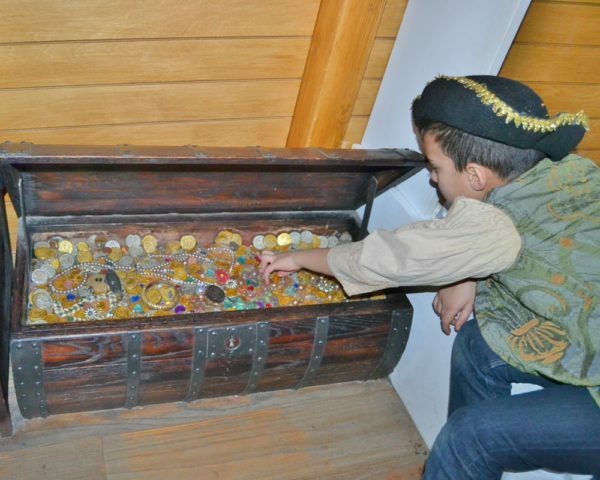 There are two children’s gallery: Ahoy! gallery for under 7s and All Hands gallery for 6 to 12 years old. At the Ahoy! children’s gallery, little man had the opportunity to dress up as a sailor and see how they lived when they were out in the sea. 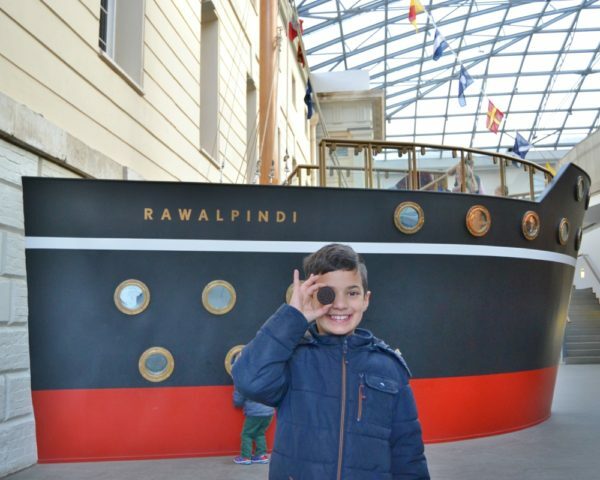 He also went aboard of the eight metre high mast of SS Rawalpindi, played with magnetic boats, sold fish at the market and explored pirate’s treasures. Little man said that he can’t wait to take his baby brother to the Ahoy! Gallery once he is born. It is perfect for young children as it is interactive. 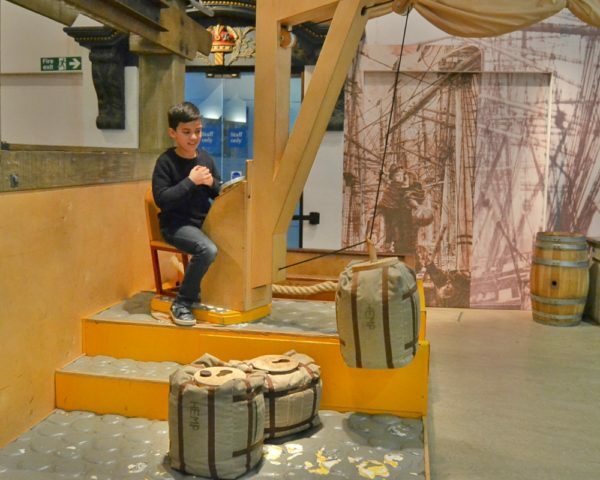 At the All Hands gallery, you can explore maritime skills and technologies, such as firing a cannon and shooting down a pirate ship. Little man really enjoyed loading cargo in the port and exploring the ship Seahorse. 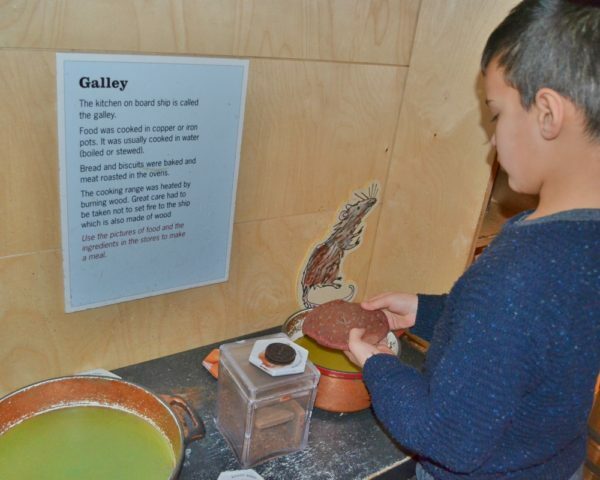 As he enjoys helping out in the kitchen at home, he had fun cooking in the galley, the kitchen on board ship, and learning that food was cooked in copper or iron pots and usually boiled or stewed. Biscuits were popular in ships as they kept longer than bread. Sadly they were not as tasty as Oreo cookies as they were simply made of flour and water. 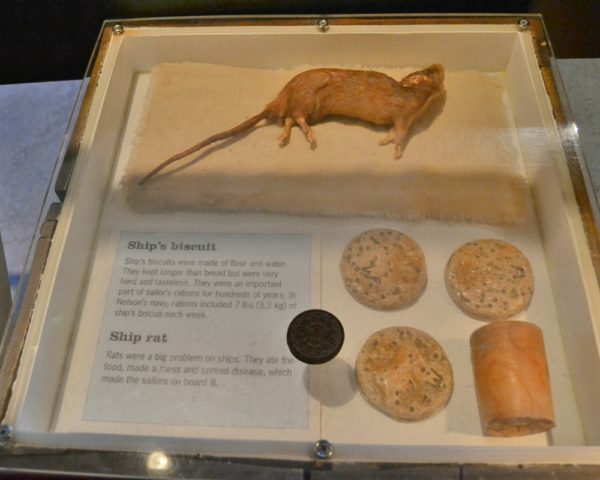 As rats were common on board, they would usually eat any food they could find, leaving the sailors hungry. Children also have the chance to learn how to send a message in the Morse code, which uses pulses of electricity. Although it was an enjoyable experience, we were grateful for modern technology as it took us ages to send a simple word. Little man has been learning about Egypt at school and hubby is Greek, so the British Museum seemed like the perfect place to explore. When we arrived, we were greeted by “The Townley Caryatid”, which is a female figure that stand in place of columns, found in Greek and Roman architecture. This statue was found around 1585-90, near the Via Appia outside Rome. Money has always been one of little man’s interests. He learned maths really quickly so he could count his coins and keep track of his savings. 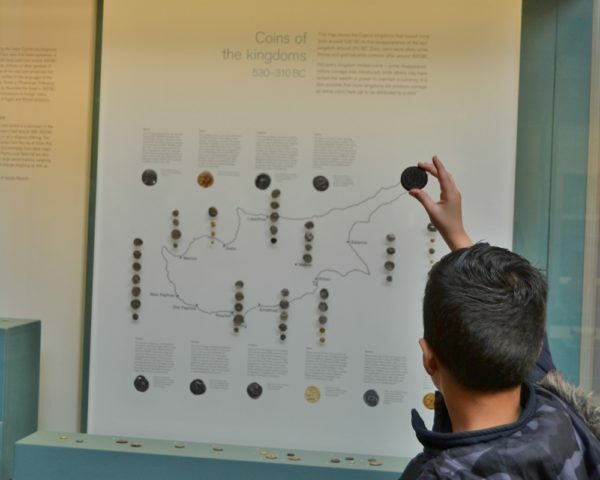 The Citi Money Gallery was our next stop, as it displays money around the world, from around 4000 years ago until today. It was interesting to learn that Cypriot kingdoms issued coins from around 530 BC to 310 BC. Once we have explored the Greek galleries, we moved on to Ancient Egypt, looking at mummies, hieroglyphs and canopic jars. 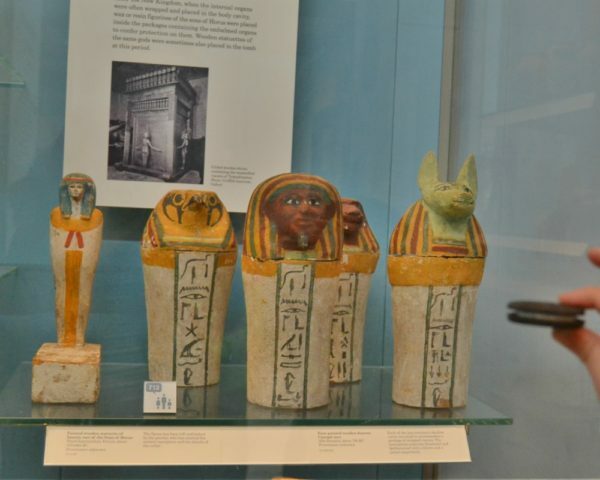 Egyptians believed that canopic jars protected their liver, lungs, stomach and intestines. Once they died and were mummified, the internal organs were wrapped and placed inside the jars. 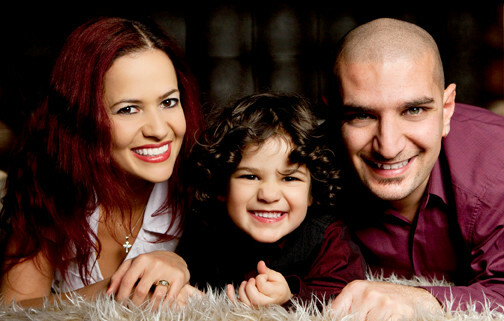 We had such a wonderful family time, building precious memories and joyful family moments. 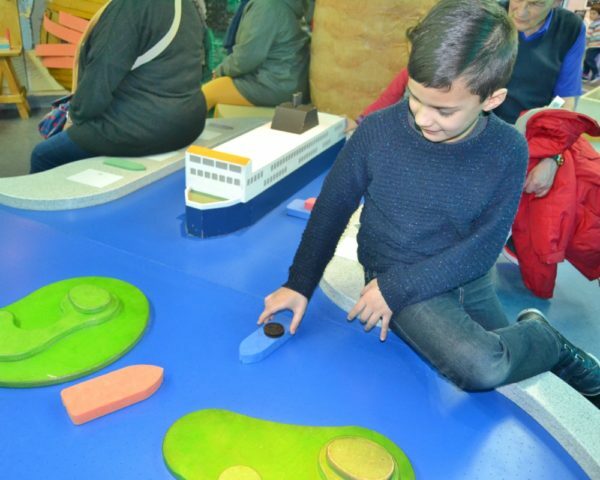 If you would like to do the same, make sure to enter our Oreo Cookie Quest competition as you can win a £100 Virgin Experience voucher to put towards a family day out. Where would you go? 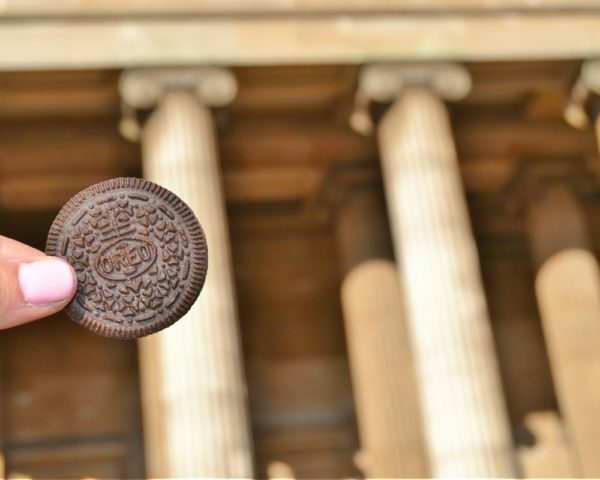 I’m working with Oreo and BritMums promoting the #OreoCookieQuest celebrating wonderfilled family moments and The Great Oreo Cookie Quest. This #OreoCookieQuest Prize Draw is free to enter and no purchase is necessary. It is open to residents of the United Kingdom (England, Scotland, Wales and Northern Ireland including the Channel Islands and the Isle of Man), excluding employees and their families of the Promoter, its associated, affiliated or subsidiary companies and agents or anyone professionally connected with the promotion. Participants must be 18 years or over. Participants enter through Gleam, stating the places where Oreos are “hidden” in the blog post to be in with the chance of winning. One winner will be chosen from the entries randomly. The winner will receive a £100 Virgin Experience Voucher. Restrictions apply (see note below). All entries stating all the correct places Oreos are featured in the blog post will automatically be entered into the drawing. It is a condition of entry that all postings are subject to the terms and conditions. Submission of a posting will be taken to mean acceptance of the rules and terms and conditions. All entries must be received by 11 March 2018 at 23.59 GMT. The winner will be chosen at random from users who enter this giveaway. The winner will be notified via the email address. They have 48 hours to respond and claim their prize after being notified, after which time the prize will be considered unclaimed and will be re-assigned using a random selection method. The winner will be published on the original giveaway blog post. Prizes are administered separately from Lilinha Angel’s World. Lilinha Angel’s World, its partners and agents cannot be held responsible for problems related to fulfillment of prizes including non-delivery or substitution due to original prize being unavailable. The Promoters accept no responsibility for technical difficulties which may result in emails not being received and therefore not eligible. The Promoter is Lilinha Angel’s World. Social Media with the hashtag(s) may be used in promotional materials for BritMums, Oreo and participating blogger sites, published on the BritMums, Oreo and participating blogger networks, used on Twitter, Facebook, Google+, Pinterest and other social media platforms and/or published in the BritMums, Oreo and participating blogger sites. Participation will be taken as agreement for use of material in this way. Restrictions: travel costs are not included. 70 Responses to "Joyful Family Moments and Competition to Win £100 Virgin Experience Voucher"
It sounds like you have had an amazing time celebrating the last of your time as a family of 3 and getting ready to become a family of 4. Love how you have hidden Oreos in the photos as well, I bet it was fun deciding where to put them. I like the idea of winning an £100 voucher to spend on a Virgin experience! I also like how you have hidden oreos in the photos too. What a lovely idea to have a half term day out with little man before he becomes the big man!! Congratulations on your pregnancy and best of luck for your due date!! The day out looks awesome. I’ve never been to this museum but it looks very interesting. Oh I would be so good at an Oreo hunt – I can sniff them out for miles haha. i would treat my mum to afternoon tea. Wow this looks and sounds like you had a fab time! What a fun way to incorporate Oreos into the pictures! Thanks for the hunt! I think I’d treat me and my husband to something – maybe an overnight stay somewhere or afternoon tea. Either a hot air balloon ride or afternoon tea! Oreos are always a winner in our house too! Good luck to all those whose who are entering the Virgin experience contest,should be a one of a kind thrill for some lucky reader! Ooh I love Oreos! What a fantastic quest, bet you had lots of fun exploring together. Love Oreo cookies and what a great contest with a fab prize too, cant wait to join it. You must be so excited to welcome in a new member to the family. 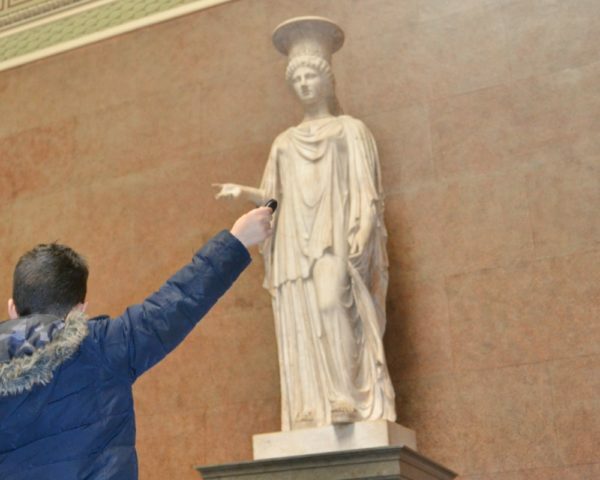 I love the fact you’ve still made the most of the time you have with visiting the museums. I don’t think I’ve been to either but I want to explore the British Museum now as I have an interest in Ancient History. The competition sounds good and whoever wins will be super lucky! I would treat my husband to something fun and exciting. We would take the kids to zipworld! Out of the two I have only visited the British Museum. I remember how I had my own quest, to try to see it all in one day. At around 4 PM, when my legs couldn’t take another step, I called it a day. 🙂 I didn’t manage to see it all. I would love to treat my mum to afternoon tea. Aw what a brilliant trip out, I really want to take my three to the British Museum, I think they would love it. I love how you have sneaky Oreos in the photos, there are some great shots. Looks like a wonderful adventure in all. I love family days out, just don’t have enough of them. It sounds like you guys had an amazing time and do it while munching Oreos! WINNER! Oh! It looks like that you had an amazing family time. I enjoyed seeing those sneaky Oreos photos. and he looks so adorable. A weekend away somewhere would be amazing. What a fab museum. We haven’t taken the kids to London yet but this will be on our list. I love all things Egyptian in particular. We’ll take some Oreos with us! There are so many great ways to spend a Virgin experience voucher that I am ha8ng a hard time deciding! I like the idea of a hidden London walk, but I also like the idea of Kew Gardens afternoon tea…then there are the theatrical trips that look amazing…A hot Air Ballon is a once in a lifetime thing, so likely to choose that! Or the Shard visit. Oh No…what is a girl to choose? Jet Boating! Or maybe a hot air balloon ride! – never done one! Such a fun adventure to spend together before the new baby arrives. I miss London’s amazing museums and must take the kids back soon. I love spotting the Oreos in these photos! I love the Oreo “treasure” in that first pic. This looks like it was a fabulous wonder-filled family day out. GreT photos – you’ve cleverly got one in each picture! Maybe treat my friend to afternoon tea. found 10 onew in each picture. Our youngest daughter would want to go somewhere that has Dinosaurs so we would help her choose the Natural History Museum. I think on a day’s photography course. I would love a luxury spa experience! I would love to send my husband on a Supercar Blast. I can’t afford a Porsche for his birthday, but he would have fun driving one! I live in Edinburgh and would probably want to do the Sparkling Afternoon Tea Vintage Bus Tour of Edinburgh for Two.